Last Sunday we did something that I had never done before. Our family and some friends visited a church in our community. No, of course we’ve visited other churches before, but not like this. We were told it was a congregation that was “racially diverse” with “energetic worship”. Their worship was certainly energetic and once we arrived, they were diverse. It felt very strange. There were a lot of people looking at us and you could tell that they weren’t sure why this little band of white folks showed up. But the worship was great. The people of the church were sweet, warm and friendly. It was really a cool experience. The guest preacher spoke from John 11, the raising of Lazarus from the dead. But he spoke from a perspective that I had never considered. So I want to share it with you because I really think there is some value in this. But I want to give credit where it is due. I don’t know his name but God does. So if this gives you a reason to be grateful, throw the props toward that brother. That brother’s message really spoke to me, for I’ve been in that tomb for a while. I’ve wondered why I couldn’t seem to make any headway. I felt for a time that God had given up on me. 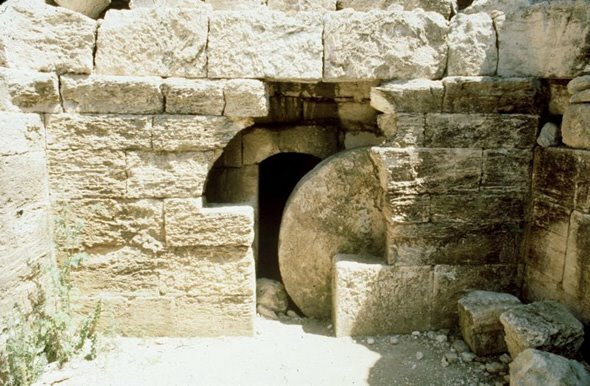 But really, He placed a stone over the tomb and he has been doing the work of decay in my life for a good while. So when you see someone change in a significant and better way, perhaps it’s God’s “work of decay”. I’m grateful for this work and I’m praying that he moves the stone soon. No, I'm not going to leave it at that. You are still a man of God and you are still flambe for Jesus, but sometimes I see that your brain is wavin in a new way. It is there in your writing, but I have seen it in more than that. Right on to the guest speaker and I pray God continues to bless him and his ministry. I think we as people tend to agree with Seinfeld when he said, "Living is good, and dying is not as good." We get hung up on the baddness of death, and the finality of it. We forget that it is because of death that we have the gifts and spiritual freedoms inhereted as children of God. Without Christ's death we got a big bag of nothin. The work of decay... I think dark, lonely, dingy, dismal, dinky, and some kinda terrible stink. That doesn't sound so great. I love how God takes something that no one else sees value in (a dead body, an old man and wife with no kids or a kid with a cool jacket sold into slavery for examples) and still He knows and works the greatness He means for them to be. We don't always know how we are going to get where we are going, but the end result seems to make the trip worth while. I don't think Lazarus dug being dead, but rising and chillin with Jesus again, I say is definately worth the down time.